I was looking around for a new category to include in this blog of mine, as a feeble attempt to get readership going again in the blog, and I kinda realized one of the biggest thing that is going on in my life at the moment is on houses. 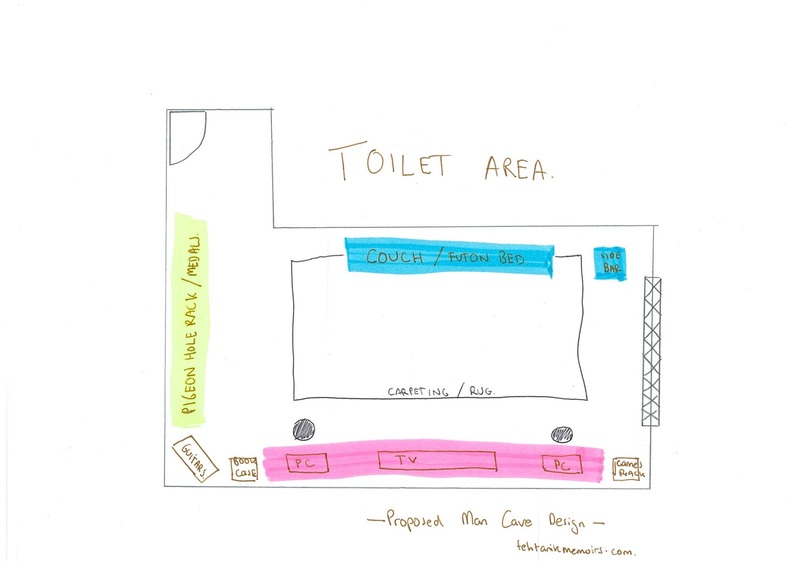 Almost all of the people around me now are so caught up with the phase where we look into indulging into houses and "our very own pads" and quite frankly I too got caught up with the bug as well. As many of you would already know, I have been hunting around for a place to call my own for the last one year, basically looking around the main township area for a decent condo to purchase (was kinda against the whole idea of renting because of something happened in the past). Gladly enough... I found the place! But thats a story for another day. 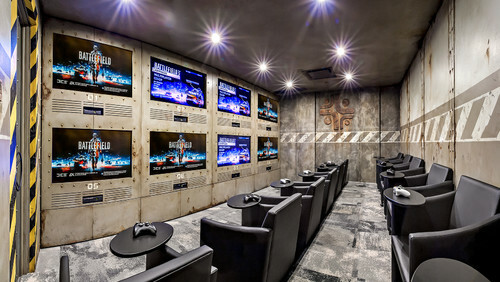 For those of you who are not aware of the "Man Cave", I would like to believe that it is in every guy's dream have his own place and most importantly, a room dedicated to them "manly" stuff and where the boys can come over, chill and watch football or even play video games on a weekend. After I managed to secure myself a place, I had to convince Ms Ave T to let me have my dream "man cave" and design it based on how I want it. After much tussling (believe me it was a hard fight), I now have a chance to build my very own Man Cave! Problem was, how was it going to look like? Which is why I found quite a lot of ideas! 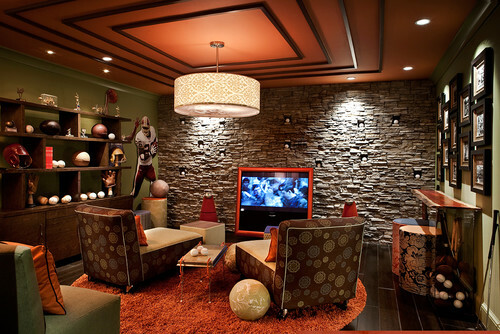 Each person would have their own specific things to be included in their "Man Cave", either being it a bar area, a sports area or such. Considering my nature I would want to include a triple screen monitor in the middle with a collection of games, books and movies at the showcased at the side of it. Kinda like my very own, nerdy Man Cave! So much like everyone else, I came up with 10 Man Cave designs which I would most likely copy for my own so far! One of the main things I would have to note is that the flooring for the room itself is similar to the picture above which is why I am loving the color combination of the walls and furniture. I'm keeping this in mind because it has the same idea of the multiple screens that I wanted to do with the cave. Awesome. For this one, I love the arrangements of display done. Kinda what I want to go for with my collections. 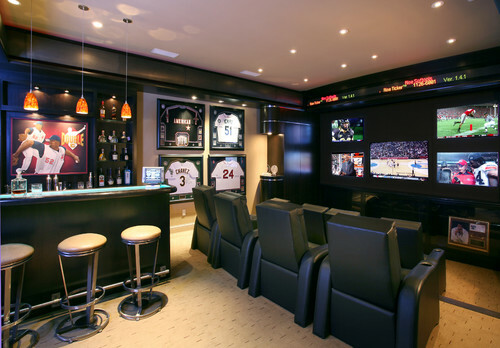 I kinda like how they arranged the sports memorabilia which I would have in my cave as well. And this one as well. Note the trophy case and the stone wall design which I am seriously thinking. Again for this one, I'm taking note of the color combo between the walls and the floor, which is essential for the decor of my cave. Simple yet looks absolutely stylish. The mounting for the monitors in this one is something I would love to implement, although it might take a lot of work to do. For mine it is going to be a three-screened monitor which would work fine for the cave. Simple and has a bachelor's feel to it. And yes, I will have a minibar in my cave so that's a plus! 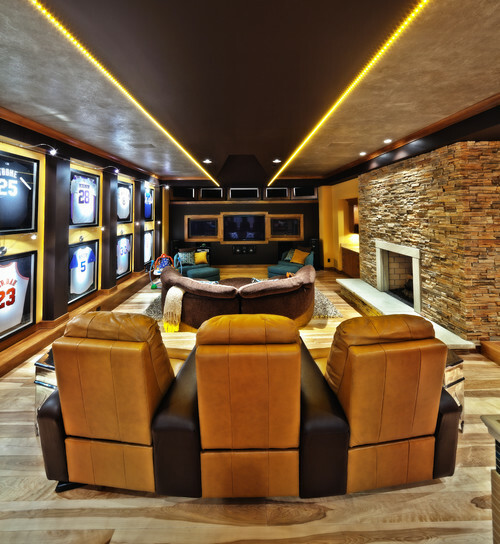 Similar idea with the long couch facing multiple screens. Plus I love the floating bookcase idea! The only problem that I am having at the moment, in comparison to the examples above, is the limitation of size of the room itself. Some may say this limits the things that I can do with the room and I'm really hoping to get as much things done with the room as possible. I believe this is a normal problem when it comes to condos in Malaysia which is why I have to be extremely smart about the design of the room and what to put in it. Problem is that I don't really have much experience in doing these designs and I need to look around for either people to help me or design ideas online. So this is going to be my next project. Watch this space guys and I will share what I find!